All three branches of government–Executive, Legislative, and Judiciary–have been captured by banks and corporations. They no longer represent We the People and the all three–the exceptional individuals notwithstanding–lack both intelligence and integrity. Below is a discussion of what responsible governance–governance focused on substance–including True Cost Economics–should look like. America—and the world—are too complicated for all of us to entrust the fortunes and fates of brave men and women to one white guy—or one half-white guy—and his cronies. We are at a turning point in history where time and events move faster than our factory-era electoral and governance processes can handle. As we enter the 21st Century, my life experience and my broad reading of the thoughts of others have come together to highlight the confrontation of eighteen major forces, half negative and half positive. 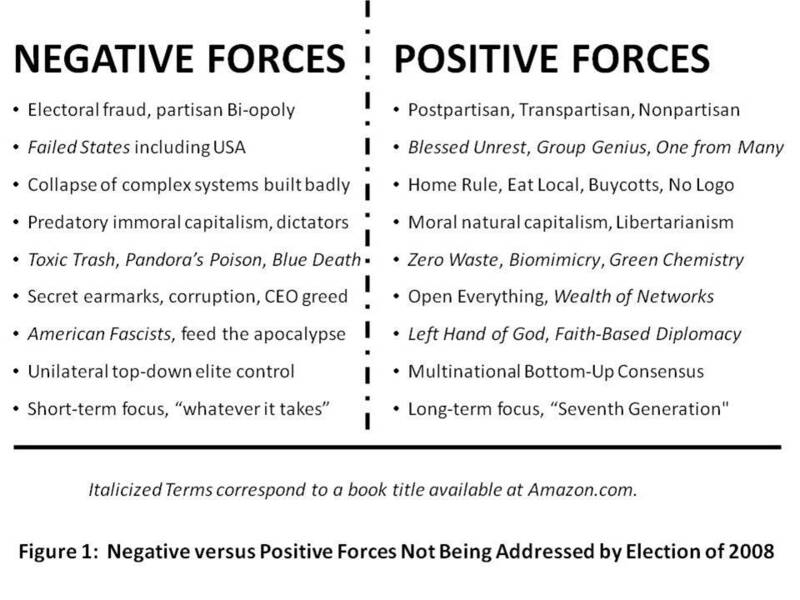 The current election cycle in the USA, in 2008, can be characterized as a remarkable one, one that fails to address either the negative forces or the positive forces, and one that fails to embrace and energize the public’s mind. Instead, the two major parties seek to dwell on personalities, lipstick, and a plethora of promises and platitudes that have no substance in relation to a balanced budget that does not exist, nor any process for improving governance in the 21st Century. To that end, we must not elect anyone who fails to address substance, now. This orientation is intended to establish a common standard for coherence that we should expect from each of the candidates, today and into the future. Put bluntly, the era of Rule by Secrecy is over. We the People are back with a vengeance, and whoever is elected, we will not stay on the sidelines. I have thought about this a great deal, and I am going to lay out for you an analytic framework and a strategy for creating a smart strong Nation that can create a prosperous world at peace. My strategy, if implemented, makes the presidency impervious to corruption or misdirection because it restores the power of this Republic to the heads and hearts of We the People on a real-time basis and in a comprehensive manner. I first addressed this need in 1994, but no one wanted to listen then. It begins with LEADERSHIP. We all have confidence in our abilities, but we must also recognize both our individual limitations, and the limitations of any partisan process. Both of the conventional candidates avoid this fundamental introspection and have failed to offer up any sensible reform proposals that can, in the ideal, make it possible for the Republic to survive a future combination of a well-intentioned village idiot and a mendacious nakedly amoral closet dictator. America needs to understand that we can have a leadership plan, we can have a holistic strategic approach and its four fundamental reforms, and demand, now, before November 2008, that we can make it possible to elect a leadership TEAM with a leadership PROCESS that is continuous, transparent, accountable, and effective in achieving the public interest. Demanding Instant Run-Off for the November 2008 Presidential Election is the best possible starting point. A popular government without popular information, or the means of acquiring it, is but a prologue to a farce or a tragedy, or perhaps both. Knowledge will forever govern ignorance, and a people who mean to be their own governors must arm themselves with the power which knowledge gives. It does not get any clearer. Sadly, the last serious and honorable initiative to nurture an educated public, the core foundation for national power, prosperity, and peace, was the G.I. Bill in the aftermath of World War II. We then settled into an Industrial Era system intended to create “good enough” factory workers who could follow orders and perform complex repetitive tasks. We created a “one to many” form of education that demanded absolute discipline, eliminated most opportunities for team learning and creativity, and ultimately created a cheating culture and a lazy culture—teaching and learning to rote. We also failed, at the national level, to realize that funding education as a local public good, one consequently dependent on both the local tax base and the dubious good intentions of local elites, would inevitably be the victim of localized corruption. Across America, the small-town elites have sold out the birthrights of our blue collar and lower middle class citizens, giving public lands and public tax exemptions to corporations in return for real estate deals and commissions that have enriched the few at the expense of the many, and made funding for education more limited at the local level. 3) the collapse of unions, the media, and political parties as advocacy or fact-finding organizations helping their constituencies participate in the political process with reasonable access to relevant information. Electoral Reform, now, will set the stage for the other three fundamental reforms. It is possible for the American public to “get a grip,” now, and take back the power. 1) Holiday and Unconditional Absentee Voting. The poor must not be forced to juggle work schedules with voting, and also allowed to demand absentee ballots while still in the local area—unconditionally. 2) Honest Open Debates. The current Commission was created explicitly to displace the League of Women Voters, hard questions, and candidates from other parties. We must fire the fraudulent and undemocratic commission, restore the League, and demand that debates in 2008 include at least four or five parties, not the current bi-opoly alone. 4) Expanded Debates and Draft National Budget Online by 24 October. It is sheer idiocy to elect one person, their chosen Vice President, and not demand any demonstration of who will select for their Cabinet, or what their spending priorities with our money. Expanded debates would require the advance selection of at least two Cabinet officers, and the creation of a notional balanced budget online, open to public dialog, that shows the economic assumptions about revenue and inflation and planned spending. In my view, we should be demanding that the candidates address the other three reforms now, before Election Day. Figure 2 above shows the four reforms and how they relate to one another. We have a chance, right now, to put substance on the table. Obviously we cannot rely on any of the mainstream media personalities and owners—they have all chosen to avoid substance, and cannot be trusted in the slightest. The remaining four reforms can be legislatively enacted now, and implemented after November 2008, in time for November 2010. 5) Tightly-Drawn Districts. It is time to end gerrymandering, a corrupt practice that shames us all, and institute tightly-drawn districts where home rule, local rule, can connect to the national legislative process. 6) Full and Balanced Representation. With the end of gerrymandering, it will become possible to allocate House of Representative seats on a state-wide basis, ensuring that Libertarians, Independents, Greens, Reforms, and others receive their fair share of House seats based on state-wide registrations. Districts can be assigned, as in the United Kingdom, in those instances where a perfect match is not available. With this reform, we can also demand an end to party-line voting and institute anonymous certified voting. 7) Full Public Funding and Free Public Airwaves. The Internet now makes it possible for us to forbid all private funding, to include funding of party or advocacy groups that endorse any candidate. Free air time in equal measure must be given to all candidates, and over time we should migrate to Open Spectrum and end this industrial-era handicapping of allocated spectrum. A campaign tax credit of $100 a year, as well as a Citizens Public Trust that seeks very small contributions (on the order of $5 to $20) from all citizens, will easily enable us to fund this and buy our government back. 8) No Legislation without Consultation. Apart from the obvious need to eliminate all earmarks and especially and immediately all secret earmarks, we must also demand that all legislation at all levels, and all budget authorizations and appropriations and allocations, be published online and available in print on demand, to each and every citizen. There should be no exceptions; funds for secret programs must be revealed at the aggregate level so that taxpayers can realize the extraordinary waste in those programs. Public meetings should be the norm. Governance Reform may take time to implement, but there is no reason why our Group Genius cannot demand that it be discussed now, and commitments made now. Modern leadership is not rocket science—it simply requires the highest ethics, total transparency, and integral interactive public consciousness. Here I propose several easily adapted measures including the naming of two Deputy Vice Presidents, the creation of an Office of Strategy, and the commitment to a non-partisan Cabinet. I am not addressing Congress but will state in passing that Electoral Reform must lead to an end to the winner take all leadership system, and be replaced with proportional allocation of leadership responsibilities in keeping with our embrace of third party alternatives. In my view, absent Electoral Reform and Governance Reform, the United States of America will dissolve. The recommendations below create a TEAM and a PROCESS that would allow any reasonable person—provided they are honest—to manage this great Nation effectively and with integrity. 1) Deputy Vice President for the Commonwealth and Deputy Vice President for National Security. The first will oversee the Office of Management and Budget (OMB), which will start Managing, not just Budgeting, and all of the Cabinet departments not overseen by the second Deputy Vice President, who will oversee the Director of National Intelligence and coordinate—with decision authority—Commerce, Defense, Homeland Security, Justice, State, and Treasury. If it were up to me, I would make Ron Paul the Vice President for the Commonwealth, Colin Powell the Vice President for National Security, and Hillary Clinton one of two Senate Leaders. The National Security Council should be converted into a National Policy Council with three Directorates: a directorate for National Security, another for National Competitiveness, and a third for National Resources (the latter addressing preserving and enhancing demographic, natural, financial, and cultural resources). This National Policy Council will be subordinate to the two Deputy Vice Presidents and the Director-General for Strategy, a nonpartisan individual appointed to the same term as the Comptroller General, impervious to politicization. Treasury Dem Felix Royatyn End deficit, end WTO and IMF, phase out Fed. Rsv. IRS Ref Gary Nolan End individual taxes, tax financial transactions, high-end goods. Policy Director Grn? Michael Bloomberg Integrate security, competiveness policy & balanced budget. Intelligence Dir. Rep Brent Scowcroft Implement the reforms in the 15 books on IC reform. Research Dir. Grn? Yochai Benkler Focus on standards, interoperability, human productivity. Strategy Dir-Gen Rep David Abshire Establish long-term planning, inter-agency focus. Surgeon General D. Himmelfarb Go after obesity, alcohol, drugs, smoking, & preservatives. NOTE: A somewhat different slate was developed for the Huffington Post and can be seen in the context of many other Op Eds related to the substance of governance in a democracy, at Steele at Huffington Post. LEADERSHIP, as Senator Sam Nunn of Georgia teaches us, must understand the threat, create a strategy, devise a force structure—decide what to invest in diplomatic, economic, information, and military tools—and then find a way to pay for it without breaking the bank. The Comptroller General at the time, David Walker, declared the USA insolvent in July 2007 (as of 2006). All of the Senators, including the two now running for President, ignored him. We have broken the bank. What we demand now will make a difference. The Director-General for GLOBAL STRATEGY will be responsible for ensuring that we address all of the threats to our Republic; that we use and properly fund all of the instruments of national power, not just the military; and that we focus on creating a sustainable model for future growth that can be adopted by Brazil, China, India, and other demographic giants whose decisions—not ours—will decide the future of our shared planet. As a long-term incumbent and the highest ranking civil servant in the Executive, this individual will be responsible for educating the public, Congress, and the media, not just the Executive. 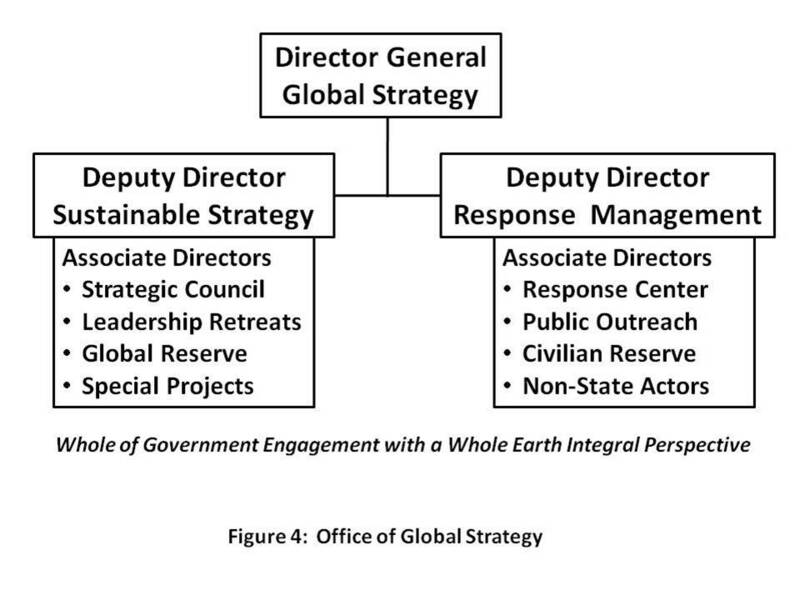 Above in Figure 4 is a depiction of how an Office of Global Strategy might be organized so as to give equal weight to sustainable long-term strategy, and the more immediate disasters and catastrophes, some of which can be anticipated, all of which require “Whole of Government” as well as “Whole of Nation” harmonization. An example helps to illustrate the difference between the two sides of this office: the Deputy Director for Sustainable Strategy would focus on standards and agreements that stop the paving over of watersheds and other natural barriers. We now know that so-called Acts of God—natural disasters—are in fact Acts of Man, building on and paving over natural flood plains—and that they turn into catastrophes when we fail to plan, prepare, or respond, as happened in the case of Hurricane Katrina. The Deputy Director for Response Management would orchestrate planning for known immediate challenges (such as a hurricane) or surprises (such as an earthquake) and also provide oversight and coordination for responses by all parties, both within the government, and within the private and international sectors. I have no doubt that properly and publicly implemented, this office will be the principal means by which We the People regain the ideals and the benefits of the Republic in which the sovereign individual reigns, and the collective intelligence of the public can be brought to bear to achieve a prosperous world at peace. It merits observation that management reform, including the creation of the Office of Global Strategy, will not be effective if we do not also demand and achieve intelligence reform, and national security reform. The first will provide shared access to all information in all languages all the time, and the second will provide at least $200 billion a year in disposable income that can be redirected from waging war to waging peace. We all need to understand that Iraq and the Global War on Terrorism are the most immediate threats to global stability and prosperity, but there are others. I am indebted to LtGen Dr. Brent Scowcroft, USAF (Ret) and other top minds from other countries for identifying, in priority order, the following ten high-level threats to Humanity: Poverty, Infectious Disease, Environmental Degradation, Inter-State Conflict, Civil War, Genocide, Other Atrocities, Proliferation, Terrorism, and Transnational Crime. We are weak on national security because the Pentagon is optimized for threat number four—inter-state conflict—while our national security policy is focused exclusively on threat number nine, terrorism. All the other threats can be directly linked to illegal immigration—all the other threats cause mass migrations that threaten the prosperity of every American citizen here at home. STRATEGY requires three things: a full understanding of reality, undistorted by ideological fantasies and partisan corruption; a non-partisan Cabinet in which each person is the best possible person for the job and committed to serving all citizens, not just the base of one party; and fiscal responsibility—we must find the means to pay for the ways to achieve the ends that we seek. The Office of Strategy will be co-equal to the Deputy Vice Presidents and will support all of us, including Congress and the public, in collective participatory democracy. LEADERSHIP at the Presidential level must also ensure that the TEAM works together. Our Cabinets of the past have been isolated silos, each Cabinet member striving to protect their Wall Street and mega-industry stakeholders, to preserve their budget share and keep transferring money from the individual taxpayers pocket to the pockets of major corporations that fund political campaigns. We must end that malpractice. Here are “snapshots” of the ten high-level threats. In every instance, corruption and fraud play a major role in nurturing any given threat. Everything here is either fact or common sense, yet none of this is being discussed by any of the four candidates representing the bi-opoly—a major reason why we need third parties in the debates. Poverty is pandemic, 5 billion globally (1 billion extreme, increasing in the USA, foundation for all else—if each of the one billion rich gave $5 a year, we energize the other five billion. Transnational Crime is seriously under-estimated. It is at least $2 trillion a year. Mafia, Vatican, Wall Street, US Government entwined. Drug cash is Wall Street’s liquidity. All of the above threats require collective citizen understanding and collective group awareness. It is not possible for the Republic to be safe if our national security is unbalanced, incomplete, or secret or not embracive of public dialog and public decision. There are twelve POLICIES that must be managed TOGETHER. 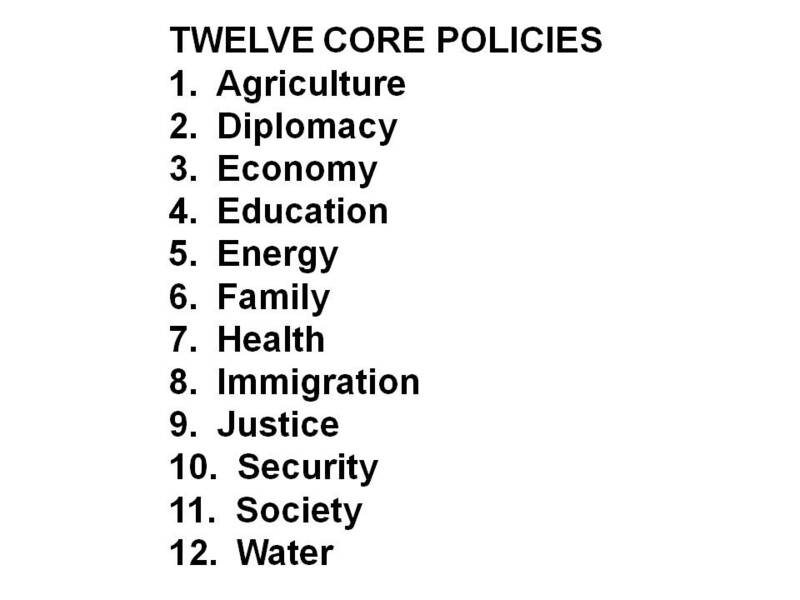 These are the twelve policies: Agriculture, Diplomacy, Economy, Education, Energy, Family, Health, Immigration, Justice, Security, Society, and Water. It makes no sense to allow landowners to sell water aquifers that are part of our national commonwealth, or to use water we don’t have to grow grain we don’t need to create fuel when we have natural gas right here, right now. ENERGY is a force for peace if we can all come together. Energy in all its forms is central to every threat and every policy—energy is not something that can be treated in isolation. 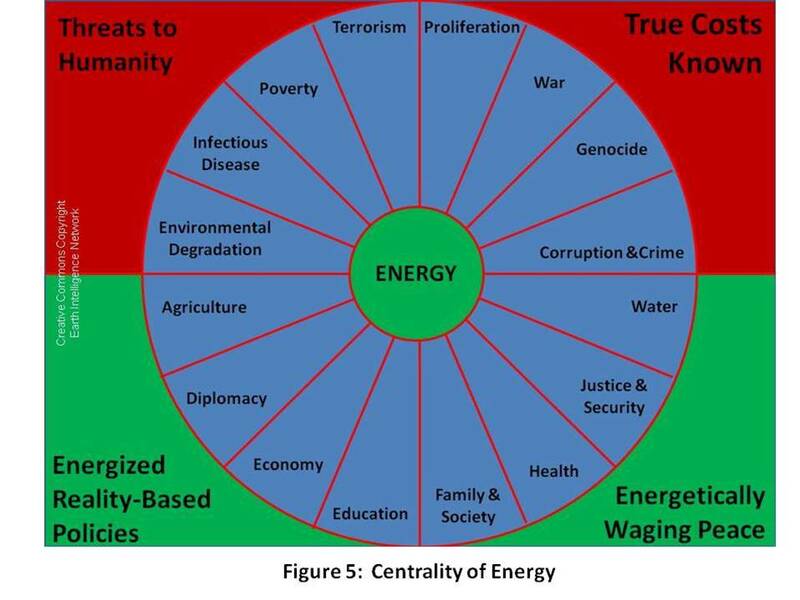 Energy is so very central to all that we do that Figure 5 is provided on the next page. The lack of clean renewable energy is totally entwined with each of the ten high level threats to humanity and the USA, while the availability of clean renewable energy is a non-negotiable foundation for the development of affordable and sustainable policies intended to create a prosperous world at peace, and—here at home, employment for all, a high quality of life for all, and a secure expectation that future generations—our children and our grandchildren and their grandchildren seven generations and more into the future—will receive from us an inheritance that can only be achieved if we all come together, share all information in all languages all the time, and make sensible sustainable decisions that respect both the limitations of the Earth, and the common needs of all and especially of the five billion poor at the base of the pyramid—poor who could, if armed with information access, generate infinite wealth. Below are snapshots of each of the twelve policies and why they matter, but first we must emphasize that the debt, not just the devaluation of the currency and the total loss of all quality of life gains from the middle class down to the very poor, but the huge $8 trillion dollar debt and the $40 trillion and up known future unfunded obligations, is a “policy” decision that is irresponsible and must be overturned. 1. Agriculture is historically the most Jeffersonian foundation for our communities and our society. We need to return to local and organic, family and community owned farming, and we must learn from our ancestors across the Americas and practice deep root farming without pesticides. It merits comment that only two sustainable agricultural models exist today: the Amish model, and the Cuban model, both without pesticides. 2. Diplomacy in the past sixteen years has disappeared as a profession. Between politically-appointed Ambassadors (our Ambassador to Sweden under President Bill Clinton paid a mere $15,000 for the job), and the conversion of our professionals into timid messengers rather than skilled observers and interpreters of foreign history, culture, and reality, we have lost our ability to understand, much less influence, the rest of the world. We need to restore diplomacy, restore the US Information Agency (USIA), and create a global information sharing and sense-making network that is multinational and competent in all languages. 3. Economy is in severe distress from a combination of Chief Executive Officer (CEO) greed; irresponsible trading in derivatives; financial managers skimming a fifth of the value from the stock market; and the destruction of unions and export of jobs. We must demand full employment of citizens, local supply chains, disclosure of true costs, and higher wages. 4. Education is both dysfunctional, and insufficient. The Chinese graduate more honor students than our total high school graduation population. Generation 2.0 is the first that is not like us, with “digital native” understanding we lack. We need team learning, learning to learn, self-paced online, and apprenticeships in the trades and professions. 5. Energy is central. We’ve known this since the 1970’s, but Congress—and our Senators in particular—has chosen to ignore both Peak Oil warnings, and the ready availability of alternative energies including wind, solar, hydrogen, sap ethanol and more recently, bacteria and termites. 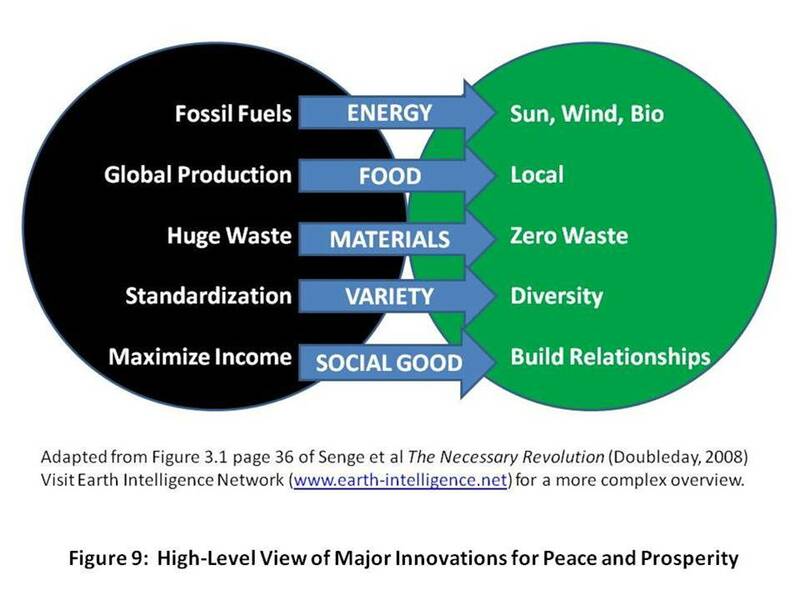 A two-way grid, natural capitalism, biomimicry, and zero waste are all achievable now. Citizens need to demand, however, that energy policy not be created in isolation from all ten threats and the other eleven policies. 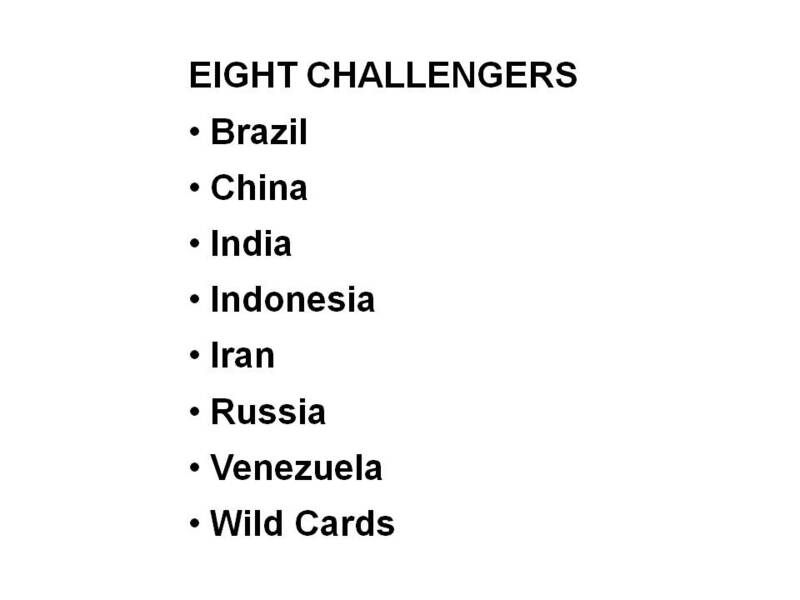 As we shall see in the next section, we must also, as a Nation, make policy that respects the massive demographic influence of the Eight Challengers. 6. Family is the foundation for any society of faith. We have killed the family in our Republic by allowing the industrial era to destroy cottage industry, family farms, and small shops—a Wal-Mart anywhere destroys all small shops for 100 to 200 miles around. That’s simply not right. Our family policy should enable one job (or two half-time jobs) to support a family, and we should do vastly more to build family-friendly neighborhoods with community centers. Like energy, family should demand a rigorous evaluation of every threat and every policy in relation to its impact on the family now and seven generations into the future. Family is central to the neighborhood, the community, the church, and and the country. It is a non-negotiable first plank that impacts on population policy, health policy, all of our infrastructure and energy arrangements, and so on. As goes the family, so goes the Republic. Medicare future unfunded obligations as well as current costs can be reduced to one percent (1%) of the existing tariffs because we can legally buy all of the drugs wholesale overseas for 1% of what we are paying now (at best—10% of what we pay now is a worst case). Evidence-based medicine is coming to the fore at the same time that our society is beginning to appreciate the sensibility of traditional Chinese medicine (TCM) and its India-based counterpart. Universal service, for both natural-born citizens and immigrants of any age, is a superb means of baselining the health of the population in multiple ways. At a minimum, it will ensure that the poor receive a complete physical examination including blood work that they would not normally have access to; and it puts all adults at a condition of physical fitness that cannot be achieved efficiently in other ways. The cultural bonding, civic duty, and social responsibility outcomes are naturally very valuable also. In my view, everybody should do boot camp together both after high school, and at mid-career, followed by a voluntarily chosen path into the Armed Forces, the Peace Corps, or the America Corps. Two years of universal service after high school or four years after college, and a mid-career fully-funded “sabbatical”, will bring us all back together. second, our federal government is incompetent at both border control and at the enforcement of visa stay limits. Latinos (and I am a Latino on my mother’s side) are not the problem. By accepting “free trade” and ignoring the true costs of exporting jobs and importing twice as much oil as most realize (half to use here, half to get Wal-Mart crap here), we have hurt our earnest blue collar and lower middle class workers twice—first sending their jobs overseas, and then making it possible for non-citizens to fill lower-paying jobs with impunity, immune to either employer responsibility or government intervention. 9. Justice cannot be addressed without understanding that we have three major failures embedded into our economy: we need to release all marijuana offenders to time served and balance in national service with a full paycheck; wind down the prison-slave complex; and eliminate corporate avoidance of liability through the personality clause. Harmonize policies and investments on a transparent basis—this means BOTH the policies and investments that are made on our behalf with our taxes, AND the policies and investments of all other stakeholders—foreign governments, corporations, international and non-governmental organizations, and foundations: we do this with shared information and the Global Range of Gifts online table discussed in the final chapter. 11. Society in the USA has fragmented. We the People, regardless of who is elected to high office, must demand English as the common language; federally-funded high-quality education across the Nation; universal service with common fitness training and then three choices: Armed Forces, Peace Corps, or America Corps. 12. Water! Most of Earth’s water is sea water, and most of the fraction that is fresh water is locked up in ice. 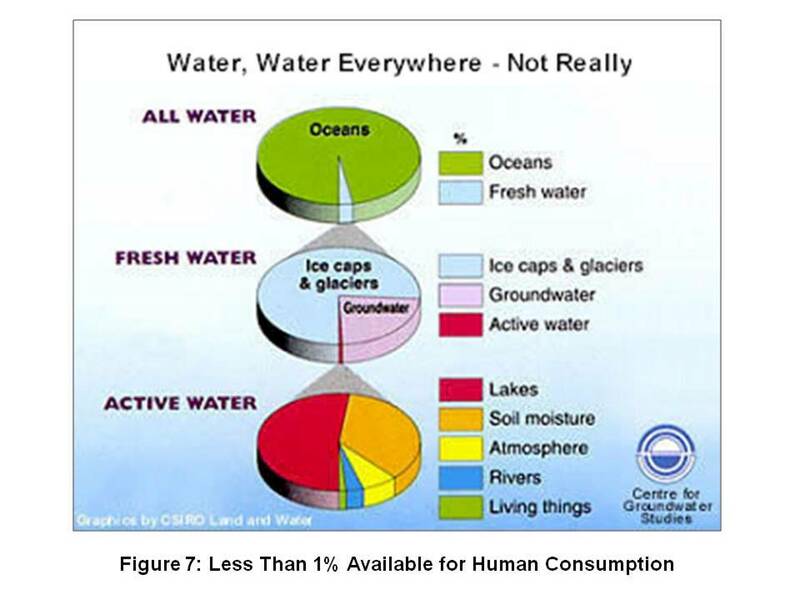 Less than 0.1% of Earth’s water is available for human use. Figure 7 provides a vital illustration from the Centre for Groundwater Studies in Australia. The primary obstacle to water desalination, apart from expense, has been energy, but with new sources of renewable energy, including deep water thermals and cost-effective wind and solar, it becomes possible to address this as a global project. Think about these trade-offs, what $100 million can buy: it can buy a Navy battleship with ammunition and crew; it can buy an Army brigade with tanks and artillery; it can buy 1,000 diplomats or 10,000 Peace Corps workers; it can buy one day of war over water….or….it can buy a water desalination plant able to produce 100 million cubic meters of potable water a year from the sea, preventing war. This is real simple: NOTHING the USA does in the next ten years is going to be relevant to the future of our children and grandchildren UNLESS we create a compelling story, model, or process that the eight demographic challengers can adopt as their own to prosper without making our Industrial Era mistakes. Here are snapshots of each. Brazil is a major demographic power that is energy independent and has a growing connection to China that is being managed out of Macau at the same time that the Chinese are pressing very aggressively to embrace all former Portuguese colonies. China is deep into two major crises that will be sustained time bombs; the first is Energy and the second is Water. All investments there are at risk, and if China has a plague break out such as is common in India, it could spread like wildfire. The Chinese are doing well at combating poverty, and they are exporting their men—Argentina will be majority Chinese by 2025. They are waging peace across Africa and South America—between the Chinese and Russians, between Brazil and Venezuela (number seven on this list)—the USA could find itself shut out of the Southern Hemisphere as a major player, in large part because the USA has been inept, predatory, and inattentive, taking both Africa and South America for granted. India, like China, has a major water crisis, and in any given year can see 2,000 poor farmers commit suicide due to draught and debt. It represents the most complex, diverse, and potentially conflict-ridden mix of languages, tribes, ethnicity, and religions, most of them very very poor, with the “rich” information technology IT) sector being a very small segment of the economy. It merits comment that India’s IT wealth stems from government investments in regional universities whose goal was to produce the most versatile and skilled IT engineers and programmers on the planet, all of them fluent in English. India, with the Indian Ocean, will be a relative equal to China, Europe, and the USA in Asian affairs specifically, and global affairs generally. Indonesia could become a major power beyond its own territorial waters. It is proving resilient to internal turmoil, and its secular government, with the Chinese business Diaspora lurking in the background, is not only continuing to educate women apace, but with the help of the secularized women, dealing effectively with religious zealots and home-grown terrorists. They are the key to the anti-piracy program in the Malacca Straits, a critical passageway for international ships bearing energy as well as other critical cargoes. Iran is what is left of Persia. We overturned their democratic election, restoring the Shah and his secret police to power. They are an extremely sophisticated nation-state, and feel besieged because they are the Shi’ite minority nation in an overwhelming Sunni world that is funded by Saudi Arabia. Iran is also paranoid about Pakistan, a Sunni nation, having the Sunni nuclear bomb. Russia is on the rebound. They are energy independent, and as their recent foray into Georgia (and the less publicized simultaneous attack on the southern end of the pipeline in the Middle East) makes clear, they can cut European energy supplies whenever they wish. Russia has enormous potential and merits complete respect—the USA has made a very serious mistake these past sixteen years in not understanding the vital importance of Russia as both a European ally, and a Caucasian bulwark against Chinese movement north in eastern Russia (Siberia, which, like the Empty Quarter in Canada, will be prime real estate as Global Warming progresses)..
Venezuela is under the rule of its President Hugo Chavez, who strives—with some substantive success—to recreate the vision of Simon Bolivar. With its oil wealth and other natural resources including a significant share of the Amazonia region, Venezuela must be taken very seriously. Chavez has succeeded in creating the South American Union, and enjoys a populist popularity. Wild Cards include the Congo, as large as the USA and very very unstable, a festering cancer of enormous proportions in the heart of Africa; Malaysia, perhaps the most stable, intelligent, and economically significant Islamic nation in the 21st Century; South Africa, which may yet unify all of Africa through its information sharing network and other measures; and Turkey, heir to the Ottoman Empire, now re-engaging in the Middle East and reasserting its historic ties with the Central Asian region. The Earth is the greatest Wild Card of all—as well as the larger Cosmos of which it is a part. Diseases are merging in animal hosts, mutating, and making the leap from animals to humans. Industry is also a Wild Card—corporations have become accustomed to unbridled license, and as Charles Perrow makes clear, the potential for catastrophic industrial chemical and nuclear accidents is higher today than it has ever been in history. We ignore all of this at our peril and at great risk to future generations. Here I provide a three-dimensional matrix that shows the ten threats, the twelve policies, and the eight demographic challengers at a glance. This should be the foundation for the current presidential race, but both of the major candidates have chosen to offer diatribe instead of dialog, and to shut out Bob Barr, Ralph Nader and the lesser known but no less important Chuck Baldwin and Cynthia McKinney, among others. In Figure 8 I seek to highlight the centrality of Family and Health to the health, security, and prosperity of the Republic, and bracket these with Energy as a “green” enabler, and illegal immigration as an “orange” disabler. 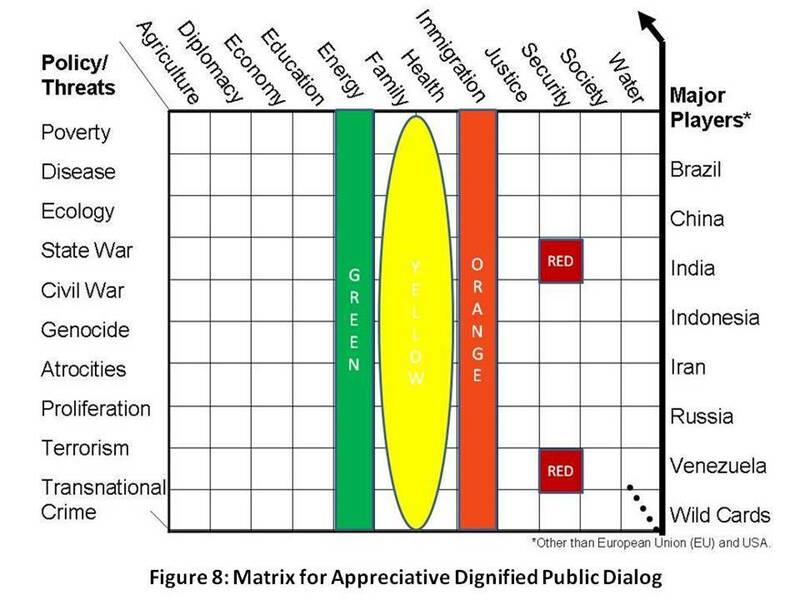 The two red squares emphasize that our current national security policy is as close to being both stupid (the village idiot) and criminal (the closet dictator). Anyone who cannot discuss the ten threats and twelve policies intelligently and in the context of a balanced budget does not merit election as President. Anyone who cannot understand the strategic imperative of accepting the need for the above analytic construct as the basis for a public dialog and the achievement of public consensus on the future of America does not merit election as President. It’s that simple. The Treaty of Westphalia and the artificiality of both the political boundaries imposed after each World War, and the relative immunity granted to “sovereign” states whose corrupt leaders chose to loot their commonwealths and genocide their peoples,  have totally corrupted the field of international relations, placing elite convenience and wealth ahead of public security and prosperity. We will need a Truth and Reconciliation Commission one day. Suffice to say that now, today, the power of the collective intelligence of We the People cannot be denied. If we combine our will with our attention, and embark on the path of appreciative democratic inquiry, respectful of all, with dignity for all, we will create a prosperous world at peace, and we will bequeath to all future generations the Operations Manual for Spaceship Earth that Buckminster Fuller knew we would need. 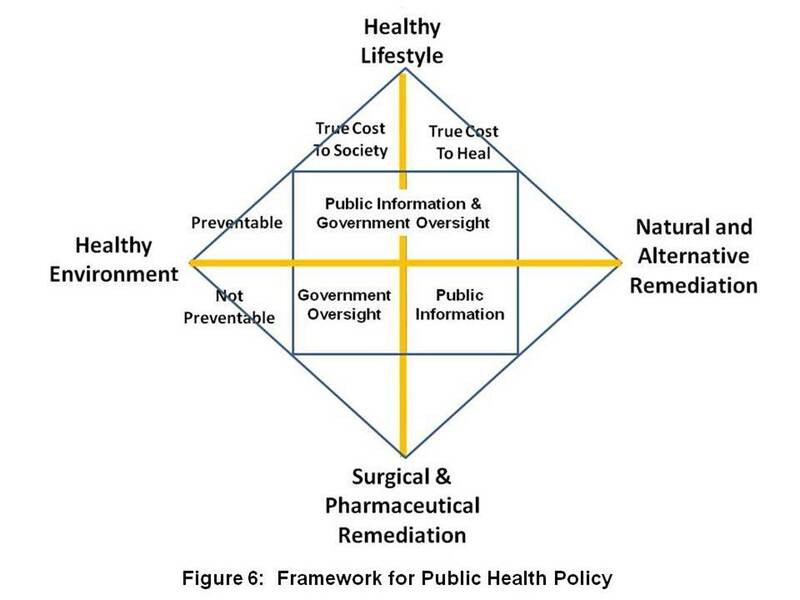 Figure 9 below presents a capstone view, borrowed from others, of the five substantive changes we must make as we go forward. Most of us that read (this does not include everyone whose source of knowledge is talk radio) understand all of this—our government, our parties, our media, and our schools all understand this, but have elected to betray the public trust. It is time we use public intelligence in the public interest, and crack the whip on all those run amok in our name. A number of now popular “memes” are represented in the graphic below, Figure 9, including Eat Local and Zero Waste. Others that matter greatly include True Cost—it is now possible to calculate with precision the true cost of a designer cotton shirt in terms of virtual water from Bangladesh, toxins flushed into the earth, and so on. Similarly, we can now calculate the true cost of Wal-Mart’s “cheap” salmon whose farming processes are killing—literally killing—the South Pacific waters where they are raised; Wal-Mart’s “cheap” non-food products are wiping out family shops for 200 miles around any superstore, and come with terrible costs that are externalized to the public in the way of fuel gallons per item, sweatshop labor that took jobs from the US, and so on. One final example: for every $4 gallon of gas we buy, Exxon and others externalize $12 in costs to Earth and future generations. Our most severe handicap as a Republic is the ignorance and apathy of our citizens. That is a learned trait, one that has been nurtured by an unethical elite—political, financial, and cultural—all too eager to see We the People fall back into patterns of slavery and impotence. We can end that servitude and escape the rule of secrecy and the dominance of bribes over votes—we can do this at virtually no cost, with no violence. We simply have to pay attention, share information, and demand answers. I write to that end, and transition to the next section with another note of appreciation to our Founders and Forebearers. You can fool some of the people all of the time, all of the people some of the time, but you cannot fool all of the people all of the time. books on the subject of secret waste and ineffectiveness and the public alternative that Alvin Toffler has called “the rival store.” Suffice to say that we are spending $60-70 billion a year on the 4% we can steal while neglecting the 96% that is not secret but is in 183 languages we do not speak. We need to demand the appointment of a Director of National Intelligence who is both fully familiar with open sources of information in all languages, and committed to properly addressing all ten threats while also providing open decision support to every Executive leader, every Congressional jurisdiction, and most importantly, feeding reliable information about reality to every schoolhouse and chamber of commerce in America. It will not be possible for this person to succeed even with the nearly unlimited funds now being wasted, because unilateral capabilities that elevate secrecy over substance are impossible to scale and inflexible. 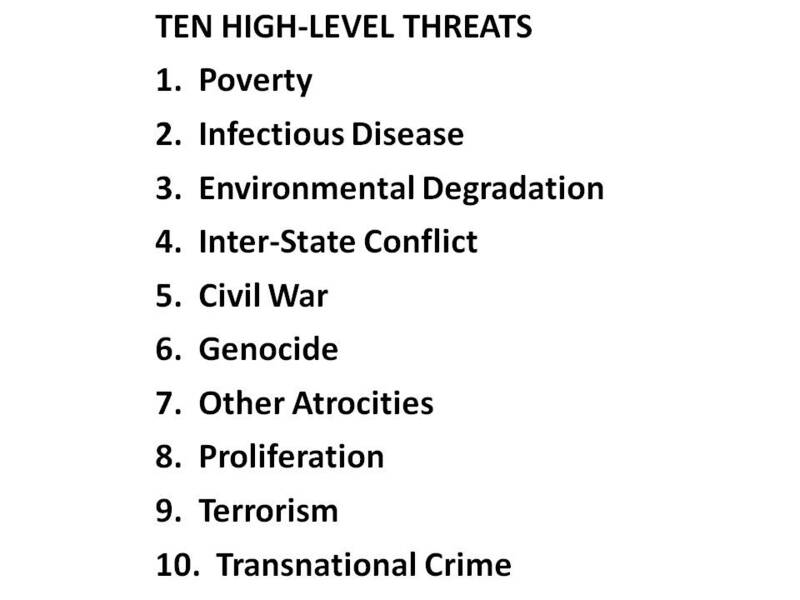 The ten high-level threats to humanity are not predominantly military threats, or even threats of overt aggression by a state, but rather threats that require stabilization & reconstruction, humanitarian assistance, and disaster relief all over the world as well as here at home, often on a moment’s notice and in many cases for sustained period of time. Below I provide an informed judgment on the degree to which each of the ten threats can be understood and neutralized using only open sources of information such as the secret intelligence community refuses to embrace. Only an implementation of Multinational, Multiagency, Multidisciplinary, Multidomain Information Sharing and Sense Making (M4IS2), a concept originated by the Nordic nations and articulated by the Swedish military, will scale. Only a public intelligence process that treats all citizens as collectors, producers, and consumers of public intelligence will scale and be flexible in the face of the high-level threats and challengers that face all of us. The military has a special role to play, and within the military, Civil Affairs. 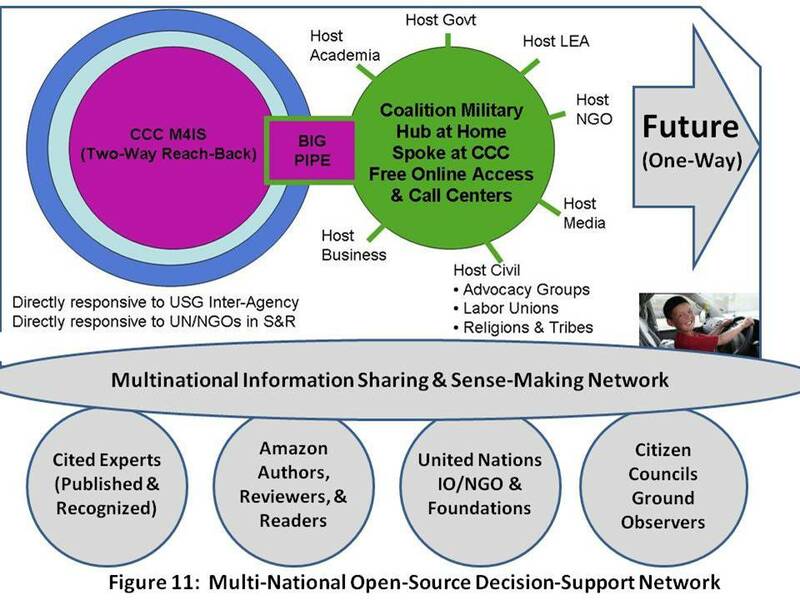 In my view, the Civil Affairs community should be the proponent for information acquisition, sharing, and sense-making in the public intelligence arena, always providing a copy of the raw information to the spies, but only a copy—the original, and all the rights to share the original, stay outside the wire, in the public domain. That is the major innovation here, for it destroys the cement overcoat that secret agencies have always sought to put on unclassified or open source information. We will share up, and we will not be constrained in sharing outwards, with any and all individuals of any nationality, race, tribe, or culture. 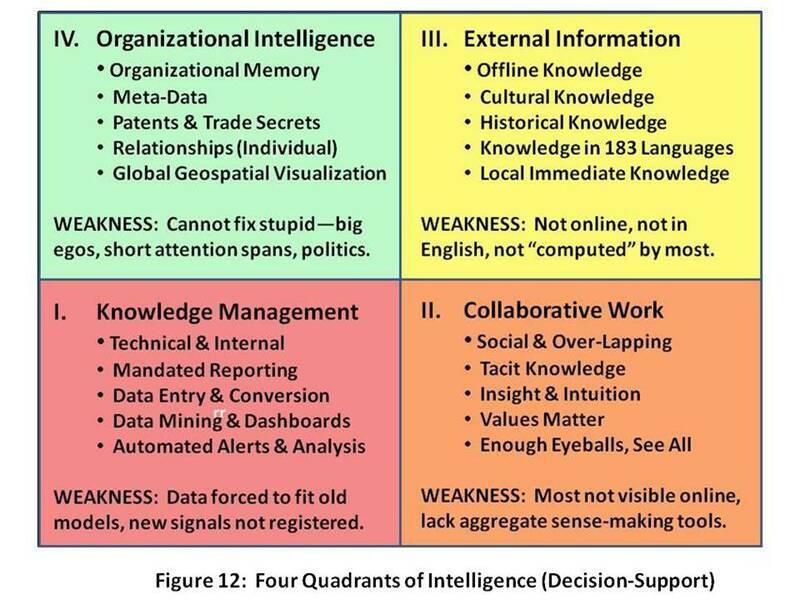 Furthermore, we will not have a Smart Nation such as I wrote about in 1994, until every citizen and every organization at every level understands the difference between knowledge management, collaborative work, external information acquisition, and organizational intelligence. We must create an Open Source Agency such as called for on page 413 of the 9-11 Commission Report, but under diplomatic auspices, as a sister agency to the Broadcasting Board of Governors (BBG). As Dr. Robert Garigue (RIP), and Herb Meyer agree,  World War III has been going on for decades, and it is a war of ideas. We are losing that war for lack of organizational and national intelligence. Lest anyone strive to undermine this argument by demanding that we not lessen our support for the U.S. military or the brave troops in the field, permit me to offer, from Medard Gabel, the co-creator with Buckminster Fuller of the original analog World Game, this graphic depiction, Figure 13, of the relative cost of fully eradicating all ten high-level threats to mankind—less than $250 billion a year—in contrast to what we spend on war: $1.3 trillion a year (this is for all nations, US spends up to $950 billion of this now). 1) All agree, with E. O. Wilson and Lester Brown also doing the math, that $250 billion a year is ample—but essential—to cure our ills. 2) All agree—as does the United Nations—that we have less than five to seven years to stop carbon emissions and stop the general destruction of the Earth with toxic waste including chlorine. 3) I speculate that all would agree that governments as now organized, and societies as now organized, are not well-equipped to understand, address, and resolve the ten high-level threats to humanity by harmonizing investments in the twelve core policies across all political, economic, and social lines. Any failure traceable to arrogance, or our lack of comprehension or readiness to sacrifice would inflict upon us grievous hurt both at home and abroad. ….. In the councils of government, we must guard against the acquisition of unwarranted influence, whether sought or unsought, by the military-industrial complex. The potential for the disastrous rise of misplaced power exists and will persist. ….. Only an alert and knowledgeable citizenry can compel the proper meshing of the huge industrial and military machinery of defense with our peaceful methods and goals, so that security and liberty may prosper together. We the People have waited too long to recognize the wisdom of the above words, words that include reference to arrogance, lack of comprehension, grievous hurt, and unwarranted influence. He concludes that only an alert and knowledgeable citizenry can compel. The time has come to take back the power and to demand the peace dividend that the last four Administrations have not only frittered away, but used to very ill effect around the world and here at home—our economy has been gutted, our infrastructure lies rotting, and failed states, including our own, have jumped from a handful to the hundred plus majority. Before articulating why we need to divide our national security enterprise into four distinct parts, I will first set the stage with a depiction of the human threats facing America. 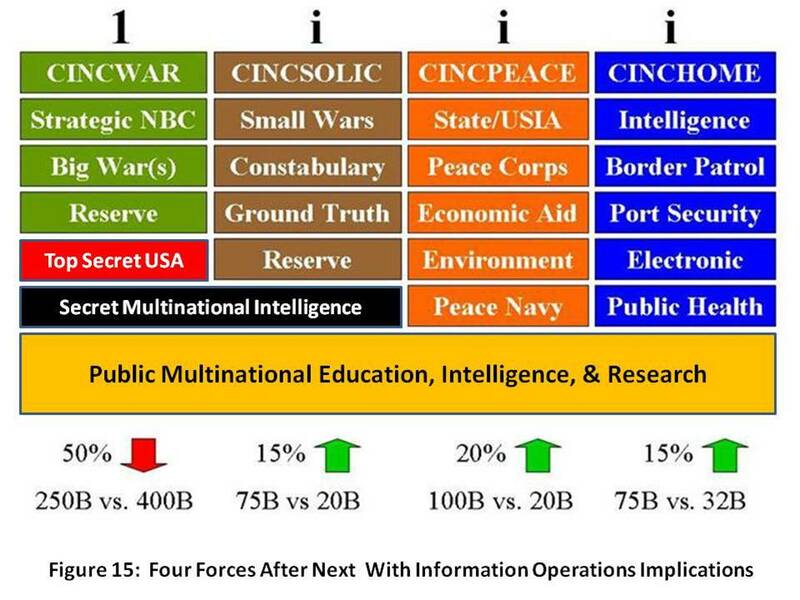 I created Figure 14 in the early 1990’s, shortly after supporting the Commandant of the Marine Corps in conceptualizing intelligence challenges for the 1990’s. 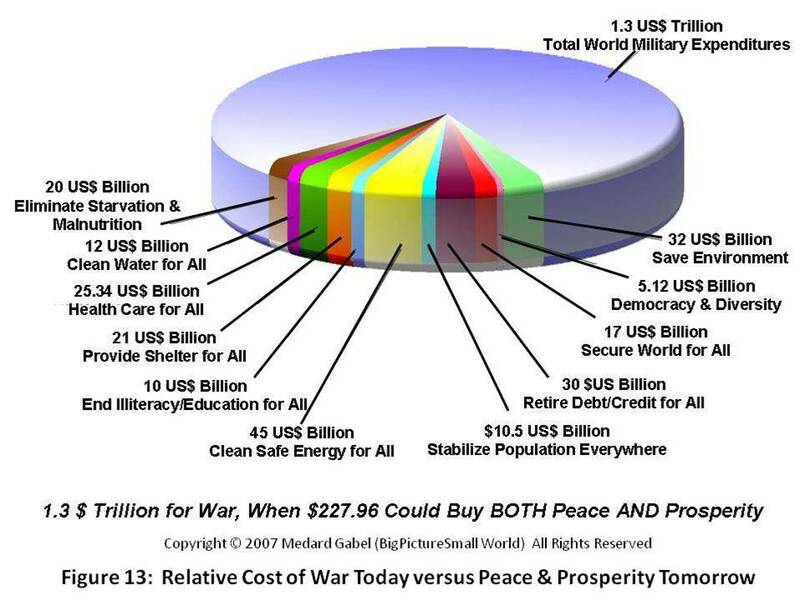 It is important for two reasons: first, because it demonstrates that we can afford to dramatically reduce what we spend on a “heavy metal” military; and second, because it helps us redefine how we might wage peace abroad while achieving security and prosperity at home. In 2007 the US Government, “in our name,” spent $30 billion on diplomacy, although one can hardly call it that—glorified messengers held prisoner in armed Embassies, fearful of all, and virtually no assistance and certainly no strategy for either orchestrating or providing directly any assistance relevant to eight of the nine threats to humanity. As for terrorism, we have used it to perpetuate our deep and good relations with forty-two of the forty-four dictators remaining on the planet—dictators whose personal greed, like the unbounded greed of our own Chief Executive Officers, can be directly connected to tens of millions of displaced persons and the poverty, disease, environmental degradation, conflict, genocide, and other atrocities they carry with them, along with transnational crime. At the same time, we spent over $950 billion, in 2007, on waging war, and by all reasonable accounts, between Iraq and the market melt-down stemming from derivatives trading run amok, We the People are facing a $5 trillion “hit” in the near term. As a side note, in 2007 we also gave Israel $30 billion, an amount equal to what we spent on diplomacy all over the world all year. That is nuts! With that as a preamble, the following, illustrated in Figure 15, should be inherently sensible for most. As with most industries, e.g. the health industry, or the prison industry, or the war industry, easily half of what we spend is fraud, waste, and abuse. Between a limited nuclear arsenal, a larger precision munitions arsenal, and a sufficiency of combined arms forces to fight one major war, we can easily get by with $250 billion a year, particularly if we respect the Eastern war of war and stop trying to substitute technology for the expert human warrior. Small War and Constabulary operations have always been underfunded, and in Iraq—which any of us could have foretold had we been asked—we spent five years hollowing out a Big War force and finally learning how to do Small War operations. We have in the process LOST our Big War force, and our entire ground force is exhausted and badly in need of refitting and rest. I have added something new to this Figure, a depiction of the Information Operations (IO) implications of the four forces after next. Open sources of information, and the resulting decision-support products that can be easily shared, are vital across all four forces. It is important to emphasize that our state and local government officials have the same needs as most of our multinational coalition partners and those belonging to non-governmental organizations: they want actionable information, not secrets. They want knowledge they can share, not secrets they cannot share. For war, a smaller investment is necessary in secret-level information that is easily shared among military partners, and need not be made public. Finally, for Big War, every top secret capability we own must be brought to bear, and generally only on our immediate unilateral behalf. We have been profligate in trying to create one huge expensive overly complex force, a force not well suited to the challenges of the 21st Century, and we have been equally profligate in trying to create one monster of a secret intelligence community, at great expense and with no accountability, that has proven relatively useless in addressing the ten threats and providing decision support to the twelve policies—public intelligence in the public interest. I continue to believe that Colin Powell should come back as Deputy Vice President for National Security and Secretary of State, and be given the tools and the budget to be Commander-in-Chief, Peace Force. 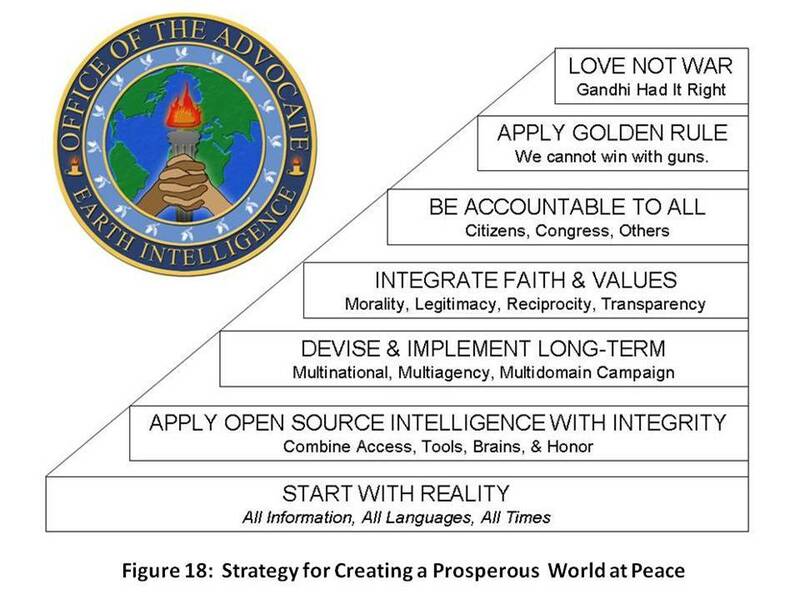 Not only can we and should be redirect $100 billion to $200 billion from war to peace, but by creating the Open Source Agency and a Multinational Decision Support Center, we can create a Global Range of Gifts Table down to the household level (and initially, down to the village level) and in this way attract and influence at least $500 billion a year in both planned organizational giving and spontaneous individual giving—giving from the 80% of the individuals that do not contribute to charitable organizations today, in part because all of them have terrible reputations and tend to spend way too much money on their own salaries and comforts. A Global Range of Gifts Table could not only identify online everything from a $2 African refrigerator to a $100 million water desalination plant, but it could ALSO encourage public dialog among all tribes, races, and nationalities, and foster appreciative inquiry and learning that leads to consensual prioritization and emphasis….a collective swarming that can lift villages, provinces, and failed states in a manner, and with a degree of speed and flexibility, that no government, corporate, or international organizational bureaucracy can equal. Finally, we need to attend to the long-neglected Home Front, to include a Manhattan-Apollo level of investment in Zero Waste, Green Chemistry, Sustainable Growth, and so on. The National Guard has a special role to play here, as they should be redirected to emphasize localized information sharing networks, and the ability to render medical, security, engineering, and communications relief anywhere, anytime. The human factor cannot be demeaned. The USA is guilty of having rushed headlong into a national security pattern that emphasizes the transfer of wealth from the individual taxpayer to the military-industrial complex and the banks that support them; we are over-emphasizing technology and secrets instead of people and public intelligence; and we have reached a point in our Republic’s life-cycle where we must abandon the top-down, industrial-era command and control approach to governance, and substitute instead a bottom-up multi-cultural consensual decision-process, both at home and overseas. This is illustrated in Figure 16. 3) It avoids the concentration of wealth that occurs when elites manipulate the commons, and creates infinite wealth for the public as a natural outcome. Similarly, now that we know that we live in an Unconquerable World, one in which We the People of any commonwealth are A Power Government Cannot Suppress, it makes sense for the USA, as a matter of national security and national interest, to eschew intimate relations with dictators; to prohibit and inhibit predatory immoral capitalism that exports jobs from the USA while looting the commonwealths of others, to take a Whole Earth perspective and to finally respect the original idea of Buckminster Fuller: the Earth is a spaceship, a container of fixed resources, size, and nature. It is, as the High Level Panel on Threats and Challenges has concluded, our shared responsibility. In brief, any definition of national security that does not encompass both the health, wealth, and happiness of our legal population, both natural and immigrant; and the health, wealth, and happiness of all other publics who would otherwise be incentivized to become illegal immigrants, is pathologically insufficient. There is reason for hope as we experience Blessed Unrest, the Tao of Democracy, and the emergence or our Collective Intelligence and Group Genius. The broad emergent literature in incontrovertible. Making everything open and transparent produces infinite wealth. As the Free/Open Source Software (F/OSS) gurus like to point out, “Put enough eyeballs on it, and no bug is invisible.” The same is true with public policy and public spending of the public dollar. We must demand transparency and complete openness at all points in the decision cycle, from open authorization meetings to open appropriation meetings to open votes in which the details of the vote have been published online beforehand, Citizen Wisdom Councils have had their say, and our legislators are not held to an unconstitutional “party line” vote. Both of the major parties are corrupt and pathologically dysfunctional—only transparency and an end to partisanship can get us where we need to go, integrating public consciousness, public intelligence, and public policy dialog in order to create public budgets that are truly in the public interest at every level of self-governance. I will not spend time here focusing on the broad literature covering increasingly catastrophic natural disasters that are in fact the product of poor human decision (e.g. paving over the Mississippi wetlands), and the potentially catastrophic disasters that should inevitably occur if we continue to allow industry to dispense and manage toxins with impunity. Elsewhere I have provided briefings on reality, and among them, my presentation to the Secretary’s Open Forum in the main auditorium of the Department of State, as well as my presentation at Georgetown University, remain of value to the public and are free online. I have also discussed our paradigms of failure and alternative paradigms we have ignored. Instead, I will conclude this section with a brief focus on the concept of deterrence, which in the Cold War was defined by Mutually Assured (Nuclear) Destruction (MAD). That does not work against asymmetric, unconventional, non-state and even non-human threats. As this is being written, two stories have appeared, a mere ten years after I and Dr. Stephen Cimbala said the same thing in our earlier piece on “21st Century Deterrence.” My philosophy on deterrence can be summed up with the now popular refrain “without borders.” None of the ten high-level threats to humanity respect borders, and this is especially true of infectious disease and the effects of environmental degradation, as well as crime and terrorism. Illegal immigration and human trafficking—both of which bypass borders with impunity—are what must be deterred, not a massive military attack. Australia is under siege from Indonesia; North America from the south; Europe from Africa; and Russia’s east from China. I spoke with the National Computer Board (NCB) of Singapore in 1994, articulating my “smart nation” concept, and they are the only ones that got it. When China gave the world Secure Acute Respiratory Syndrome (SARS), the only Ministry of Defence on the planet that “got it” was Singapore’s: they realized they must prevent all threats from entering Singapore, not just those wearing uniforms, carrying guns, and using military communications networks. Since then Singapore’s focus on monitoring all threats all the time, in a 360 degree manner, has become a model that the USA is far from being able to replicate. I want to point out, as a preamble to the next chapter on Legitimate Grievances, that we can either discover civil re-engagement and a broad vision of the possibilities for the Americas—one that does not surrender our national sovereignty or cultural identity as a Christian English-speaking Republic—and reprise to the topic of Strategy—or we can fall prey to the specter of secession run rampant, and see the Republic dissolve—as Benjamin Franklin so wisely noted, we have “A Republic—if (we) can keep it.” In the graphic above, note the Empty Quarter, an area that will be ripe for population and sustainable development in the next five years as Global Warming goes on. Our society has fragmented. 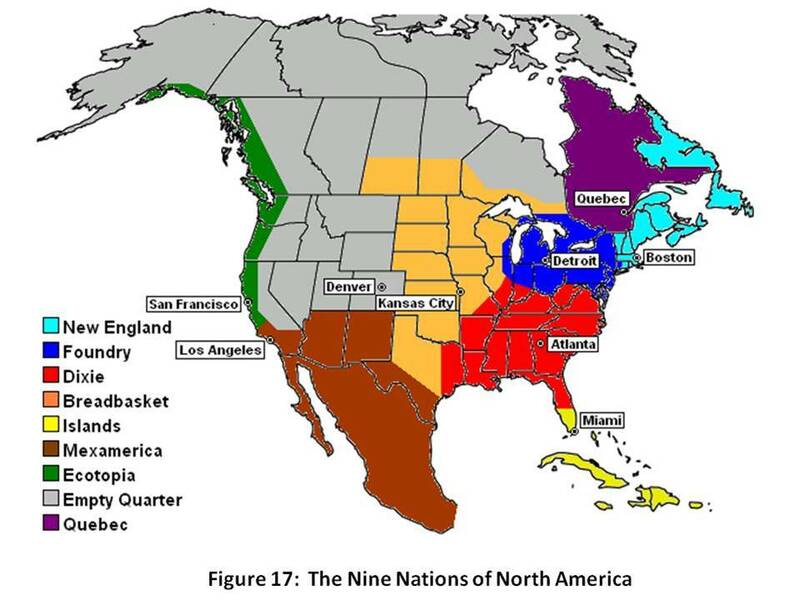 I am very aware that our Republic is actually “nine nations,” each unique and some beyond our borders: New England, the Foundry states, Dixie, the Breadbasket, the Caribbean Islands including Cuba, MexAmerica, Ecotopia, Quebec, and the Empty Quarter of Canada and Alaska that may be a future frontier for all of us. I am also acutely aware of the 27 secessionist movements, not least of which are those of the Second Republic of Vermont, the South, and the Pacific Northwest. They all have legitimate grievances, grievances we must listen to, grievances we must promise to address. What your federal government has done to us, and overseas in our name, has not generally been in the best interests of the public. There are legitimate reasons why “the rest hate the west,” although I would be among the first to observe that foreigners know with precision the difference between We the People, our government, our military, our aid, and our vulnerability to political high crimes. We have not been good stewards of our commonwealth. Now, however, we have a chance to come together and change the governance model back toward participatory self-governance. I invite every eligible voter to get back in power by demanding of their elected representatives the Instant Run-Off and Electoral Reform, or be voted out of office in November 2008. Colin Gray teaches us in Modern Strategy that time is the one strategic element that cannot be bought, nor replaced. Use it or lose it. A major aspect of my reformist endeavors all these years has been the faith that I have developed and sustained in what one might call “the average American.” Long before the flood of books about smart mobs, the wisdom of crowds, group genius, one from many, and so forth, I believe we have all understood that common sense, dignity given and received, and “one for all and all for one” mindset, can achieve miracles. We have lost that at the organizational level, but we are rapidly gaining it back at the individual level. From the Tao of Democracy to Citizen Wisdom Councils to Conversations that Matter to Deliberative Dialog to Integral Consciousness, the Collective Intelligence of We the People is emergent with a force that no government can repress. 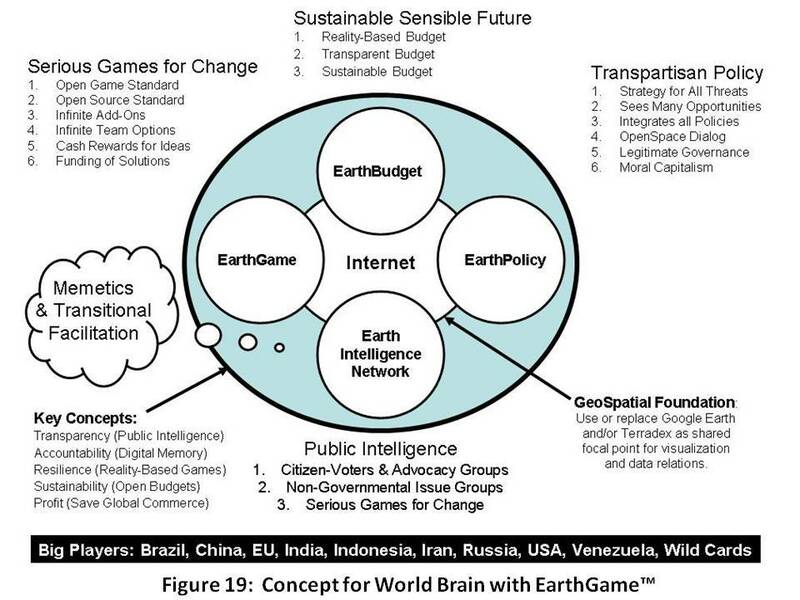 To that body politic I address my final remarks, providing both a strategic vision for creating a prosperous world at peace, and an operational construct for how to leverage the Internet, an EarthGame™ to be created under the direction of Medard Gabel, and online open budgets. It has been my good fortune to have lived around the world for decades as the son of an oil engineer, to have been a Marine Corps infantry officer, a spy, a businessman, and now a non-profit organizer. In all that time, I have come to appreciate more and more the elegant simplicity of The Golden Rule and the phrase current in the 1960’s, Make Love, Not War. It is imperative that we dismiss the political, financial, cultural, and ideological lies that are being purveyed by groups that know better, and individuals who abuse the public trust on a daily basis. As Joe Trippi has noted, the revolution will not be televised. The revolution is here now, and it starts with each of us appreciating reality and working together to share all information in all languages all the time. The literature is clear: sharing information creates wealth—revolutionary wealth, infinite wealth, the wealth of networks. Our second step is the application of the methods of intelligence (decision-support) that most do not learn in school and that differ substantially in their rigor from standard research or market analysis. The hedge funds and the energy and pharmaceutical companies—and a handful of other companies like VISA and Coca-Cola—are at the top of the public as well as (in some cases, the industrial espionage) pyramid, but this knowledge is free and anyone can learn it and apply it. practice the Golden Rule while waging peace, not war. Love has a tangible value! The broad non-fiction literature as well as the life experience of hundreds of thousands of disabled veterans and millions of dead around the globe are compelling: the Cold War was a fifty-year wound; the world is unconquerable; and we are now paying for the sorrows of empire as our cheating culture comes to a grinding pause in the aftermath of two decades of greed, corruption, partisanship, and—on our part—public apathy. ENOUGH! It’s time to put We the People back into the Republic. We do this in two ways: by eliminating the information asymmetries that have enabled Rule by Secrecy (including secret earmarks), and by creating a collective Peoples’ Trust Fund that raises $500 million a year with which to buy back our government and bury the special interests. I address that in the final chapter. Here are the key points from Colin Gray’s MODERN STRATEGY, still the best book on the subject. Technology does not a revolution make-nor can technology dominate a national strategy. Security strategy requires a holistic approach—a renaissance capability of managing a multiplicity of capabilities-diplomatic, economic, cultural, military, psychological, information-in a balanced manner. “War proper” is not exclusively about force of arms, but rather about achieving the national political objective by imposing one’s will on another. Tt is not enough for America to have a preponderance of the traditional military and economic power in the world-we must also accept the burden and responsibility of preserving the peace and responding to the complex emergencies around the globe that must inevitably undermine our stability and prosperity at home. of all the dimensions of strategy that are brought forward, one-time-is unique for being unimprovable. Use it or lose it. Time is a strategic dimension too little understood and consequently too little valued by Americans in particular and the Western alliance in general. The Clausewitzian “trinity” is less about people, government, and an army, than about primordial violence, hatred, and enmity (the people); chance and probability on the battlefield, most akin to a game of cards (the army); and instrumental rationality (the government)-and that these are not fixed isolated elements, but interpenetrate one another and interact in changing ways over time and space. He highlights the weakness of the American strategic culture, notably a pre-disposition to isolationism and to technical solutions in the abstract. 3) small wars and non-traditional threats-asymmetrical threats-must be taken seriously and co-equally with symmetrical regular conflicts. I will conclude this portion of the book with a snapshot of what I see as immediately possible in the way of a Web 4.0 platform that empowers the end-user and makes constant real-time deliberative democracy possible. Additional details are in the final chapter. third, a community of practice that brings together all of the stake-holders and all relevant experts, both published and unpublished, in all relevant languages, with all requisite historical memory and cultural nuance understanding. Fourth and last, but vitally important, each community of practice needs an actual budget, a budget that shows what is available to spend, and that does not assume, as our government budgets tend to, that everything will break our way. In the context of that online visible budget, appreciative inquiry can take place, and “seventh generation” consensus can be established. Consensus, not control, is the only sustainable form of human agreement. a lack of voluntary but pervasive standards such as are now emerging from pioneers such as Pierre Levy, creator of the Information Economy Meta Language (IMTL). IBM and Oracle and CISCO are not being helpful. They are obstinately obtuse about the threat that Google represents to privacy, property, and innovation, and completely unwilling to understand that the next big leap in mankind’s evolution is going to come from bottom-up communal innovation that rejects corporate personality, immoral and toxic offerings, and externalized waste. Heaven on Earth is here, now, all we have to do is create an “open everything” information sharing and sense-making environment. The balance of this book will explore legitimate grievances; the candidates on the issues (more fluff than substance); the art and science of living within a balanced budget; and finally, the call to arms for the public—a call to create a Liberty Fund with which to buy back our government and restore unions across all workplaces, and a call to create a global range of gifts table that not only provides people to people empowerment, but also demands of foundations as well as corporations, governments, and international as well as non-governmental organizations, respect for documented needs. This final figure is a preview of a public populist platform that is under construction today, one that I hope will empower the public and elevate the poor to create a prosperous world at peace. Show me a candidate who understands all this, and we can be a Republic again. St. NOTE: As of 5 October 2011 as this is posted, I am unemployed–antithetical to all that the current corrupt US Government represents–and available to serve as directed by the public. 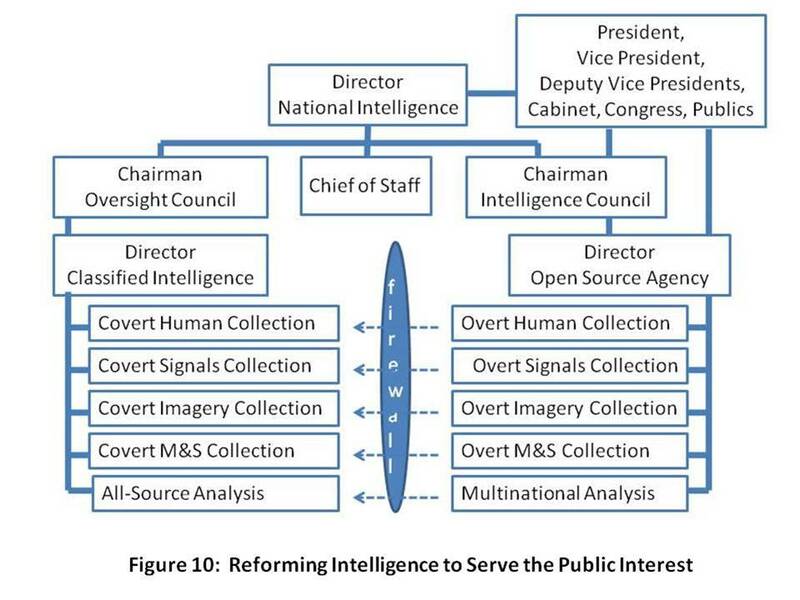 Robert David Steele-Vivas, “Creating a Smart Nation: Strategy, Policy, Intelligence, and Information,” Government Information Quarterly Vol 13, No 2 (1995), PP 159-173. Available online via www.oss.net/BASIC. I did not understand small town fiefdoms until I read Joe Bageant, Deer Hunting with Jesus: Dispatches from America’s Class War (Three Rivers Press, 2008). See my review at Amazon. John Bogle, The Battle for the Soul of Capitalism: How the Financial System Underminded Social Ideals, Damaged Trust in the Markets, Robbed Investors of Trillions – and What to Do About It (Yale, 2006). His book, Crashing the Party: Taking on the Corporate Government in an Age of Surrender (St. Martin’s Griffin, 2002) provided most of these. The best books I have found on the condition of the poor include David Shipler, The Working Poor: Invisible in America (Vintage, 2005); Sudtir Alladi Venkatesh, Off the Books: The Underground Economy of the Urban Poor (Harvard, 2006); and Barbara Ehrenreich, Nickel and Dimed: On (Not) Getting By in America (Holt, 2002). 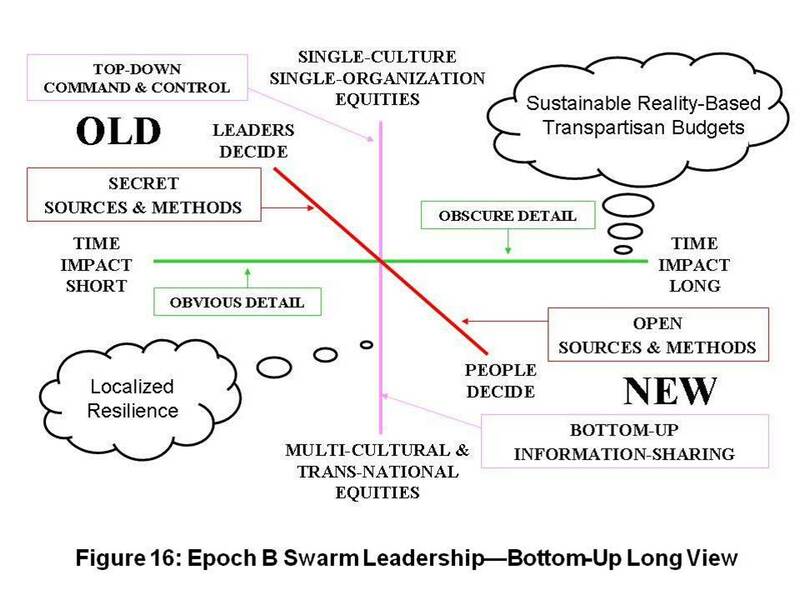 The best available paper online is David Weinberger’s chapter, “Open Spectrum,” as published in Mark Tovey (ed), COLLECTIVE INTELLIGENCE: Creating a Prosperous World at Peace (Earth Intelligence Network, 2008). The book as a whole, and individual chapters, are available free at www.oss.net/CIB. The notional non-partisan cabinet as put together by Michael Cudahy, former campaign manager for Barry Goldwater; Jock Gill, former communications specialist for Bill Clinton, myself, and several others. BoP refers to C. K. Prahalad, The Fortune at the Bottom of the Pyramid, which posits that capitalism must refocus from the one billion at the top with a one trillion income, to the five billion at the bottom with four trillion in income. Empowering the poor will create infinite wealth and ameliorate most threats. Nurture a new party, the Fiscal Conservatives, combining moderate Republicans and conservative Democrats—take the middle away from the extreme Right. Although the Cabinet officer need not be (but ideally would be) someone with Reformist credentials, sufficient subordinate positions could be assigned to Reform-approved individuals so as to assure influence. Although the Cabinet officer need not be (but ideally would be) someone with Green credentials, sufficient subordinate positions could be assigned so as to assure influence. He’s done it before, we have over 250,000 new disabled veterans from two Gulf Wars, make it a much more important job with lasting benefits to all veterans. Director of Middle East Affairs at the Council on Foreign Relations, strong believer in the two-state solution, give him a 10 year appointment and the money to make it work. At Yale Law, author of Unconquerable World, knows what questions to ask and what values to weigh. Honest broker, serves as traffic cop and omsbudsman, not policy driver. Served in Bush I, author of The Making of a Conservative Environmentalist. Strong on a flat tax and dumping of tax code, could lead a revolution in simplification of taxes—IRS gives citizens wrong information close to 75% of the time. Tax reform is a huge issue. Libertarian candidate for President, has strong views that could help to shake up IRSl. Deputy OMB under Bush, moved to NASA, respected by OMB professionals. Policy PG supervises a deputy for national security, a deputy for national (economic) competitiveness, and a deputy for “ends and means” or national resources of all kinds—water, energy, demographics, land, money. 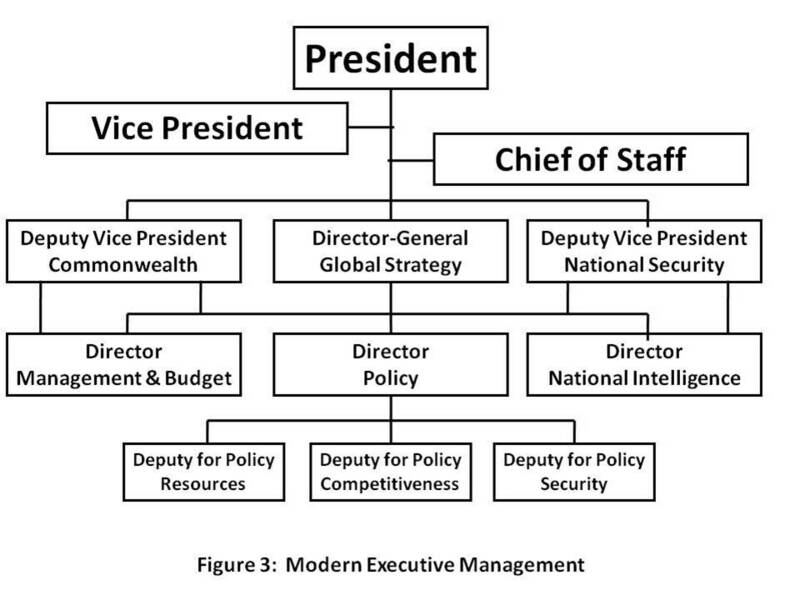 This is a “demotion” of national security advisor, and an elevation of more holistic policy-making. Former defense aide to Senator Gary Hart, first proponent for maneuver warfare, leader of the Cultural Conservatives, big-picture and long-term view. Former trade representative for Reagan, author of Opening America’s Markets. Consider as long-term appointment with intent to promote them as a future Secretary-General of the United Nations, or to key Undersecretary General slots. His report is at http://fms.treas.gov/fr/06frusg/06frusg.pdf. His testimony to the Senate was ignored. Relevant to this chapter, see respectively “The Asymmetric Threat: Listening to the Debate,” Joint Forces Quarterly (Autumn/Winter 1998-1000), pp 78-84 and “Rebalancing” (Working Paper, 2008). Ted Steinberg, Acts of God: The Unnatural History of Natural Disaster in America Oxford, 2006). Another book by Charles Perrow, The Next Catastrophe: Reducing Our Vulnerabilities to Natural, Industrial, and Terrorist Disasters (Princeton, 2007) compares, as the title suggests, the relative costs of three distinct types of disasters, finding that we spend next to nothing on first two and are relatively clueless about the third. A More Secure World: Our Shared Responsibility (United Nations, 2004). I created this illustration while thinking about how to recast the energy diatribes into a broader strategic dialog that encompasses recognition of all ten high-level threats, and harmonization of all twelve policies. Stephen D. Mumford, The Life and Death of NSSM 200 : How the Destruction of Political Will Doomed a U.S. Population Policy (Center for Research on Population & Security, 1994). The Pakistani nuclear program owes its health to both the deliberate overturning of US proliferation controls by Dr. Zbigniew Brzezinski, then National Security Advisor for President Jimmy Carter, and to the flood of money—billions and billions of dollars—from the secret agencies to the Pakistani Inter-Services Intelligence (ISI) which most of us believe appropriated at least half if not two thirds of all funds for themselves and selective investments in the Pakistani nuclear program, including the acquisition of French submarines capable for firing nuclear missiles. Philip Allott has created a startlingly original and deeply inspiring condemnation of the Treaty of Westphalia and all that ensured, in his The Health of Nations: Society and Law beyond the State (Cambridge, 2002). On Western deceit as well obliviousness in the Middle East, I recommend Barry Lando, Web of Deceit: The History of Western Complicity in Iraq, from Churchill to Kennedy to George W. Bush (Other Press, 2007) and Lawrence Wright, The Looming Tower: Al Qaeda and the Road to 9/11 (Vintage, 2007). Among the titles I most admire are Pierre Levy, Collective Intelligence: Mankind’s Emerging World in Cyberspace (Basic, 1999); Barry Carter, Infinite Wealth: A New World of Collaboration and Abundance in the Knowledge Era (Butterworth-Heinemann, 1999); Thomas Stewart, The Wealth of Knowledge: Intellectual Capital and the Twenty-first Century Organization (Doubleday, 2003); Howard Rheingold, Smart Mobs: The Next Social Revolution (Basic, 2003); The Wisdom of Crowds: Why the Many Are Smarter Than the Few and How Collective Wisdom Shapes Business, Economies, Societies and Nations (Anchor, 2005); Glenn Reynolds, An Army of Davids: How Markets and Technology Empower Ordinary People to Beat Big Media, Big Government, and Other Goliaths (Thomas Nelson, 2007); Keith Sawyer, Group Genius: The Creative Power of Collaboration (Basic, 2007); Alvin and Heidi Toffler, Revolutionary Wealth: How it will be created and how it will change our lives (Doubleday, 2007); Yochai Benkler, The Wealth of Networks: How Social Production Transforms Markets and Freedom (Yale, 2007); Don Tapscott and Anthony Williams, Wikinomics: How Mass Collaboration Changes Everything (Portfolio, 2008); Clay Shirky, Here Comes Everybody: The Power of Organizing Without Organizations (Penguin, 2008); and Charlene Li and Josh Bernoff, Groundswell: Winning in a World Transformed by Social Technologies (Harvard, 2008) and perhaps my favorite, Paul Hawken, Blessed Unrest: How the Largest Social Movement in History Is Restoring Grace, Justice, and Beauty to the World (Penguin, 2008). Of course I want to include in this list Mark Tovey (ed), COLLECTIVE INTELLIGENCE: Creating a Prosperous World at Peace (Earth Intelligence Network, 2008). Alvin and Heidi Toffler, Revolutionary Wealth, and Yochai Benkler, Wealth of Networks. All are easily found at Amazon, and also available free at www.oss.net. The first authoritative publication of these figures can be found in Robert David Steele, “Open Source Intelligence,” in Loch Johnson (ed), Strategic Intelligence: The Intelligence Cycle (Praeger, 2007), Chapter 6, pp 96-122. It is online at www.oss.net/OSINT-S. TIME Magazine and Forbes ASAP, both online, have published articles on this topic. Other references can be found at www.oss.net/BASIC.. Page 13 as slide, from Chapter 13 of the National Commission on Terrorist Attacks on the United States. Dr. Robert Garigue, a Canadian naval officer and then banking security manager, was one of the early few in the 1990’s who truly understood the implications of Information Operations from both a cyber-security point of view, and a global belief systems and semantics point of view. He died before he could produce his own book—his major published statement relevant to this material is his Technical Preface to INFORMATION OPERATIONS: All Information in All Languages All the Time (OSS, 2006). Herb Meyer, a Wall Street publisher who agreed to serve Bill Casey as a senior executive assistant, is author of the book Real World Intelligence, and one of the pioneers of the Open Source Intelligence & Commercial Intelligence world. More recently, he has published seminal observations on the global and domestic cultural wars. Cf. Herman Daly and John Cobb, For the Common Good: Redirecting the Economy toward Community, the Environment, and a Sustainable Future (Beacon Press, 1994); Herman Daly and Joshua Farley, Ecological Economics: Principles And Applications (Island Press, 2003); E. O. Wilson, The Future of Life (Vintage, 2003); and Lester Brown’s latest of many book, Plan B 3.0: Mobilizing to Save Civilization (Norton, 2008). 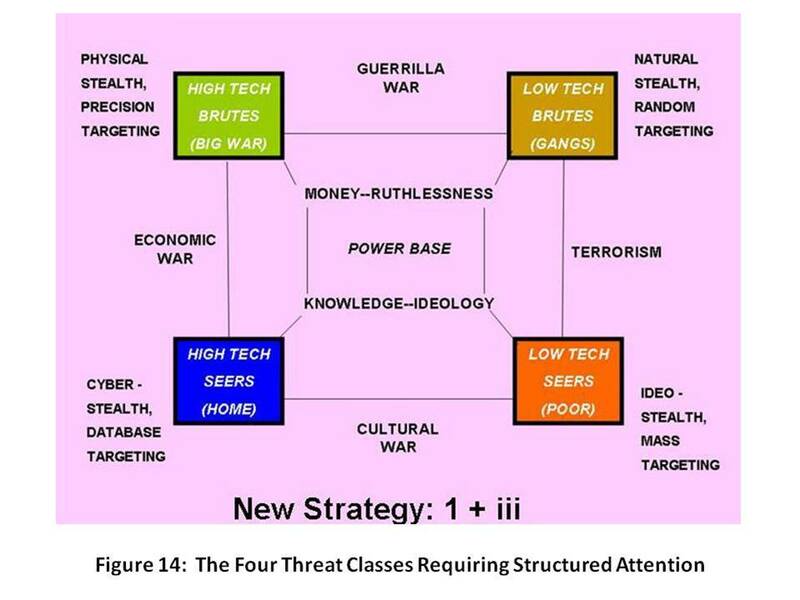 General Al Gray, “Intelligence Challenges for the 1990’s,” American Intelligence Journal (Winter 1988-1999). The article is available online. Mark Palmer, Breaking the Real Axis of Evil: How to Oust the World’s Last Dictators by 2025 (Rowan & Littlefield, 2005). On CEO greed, I rather like Lee Iacocca, Where Have All the Leaders Gone? (Scribner, 2007). While Senator Tom Cochran (R-OK) and Senator Barack Obama (D-IL) merit recognition for co-sponsoring the Legislative Transparency and Accountability Act of 2006, it allows secret earmarks and meetings. Charles Perrow, The Next Catastrophe: Reducing Our Vulnerabilities to Natural, Industrial, and Terrorist Disasters (Princeton, 2007). My 9/11 press release summarizes the situation. Joel Garreau, The Nine Nations of North America (Avon, 1989). Peter Peterson, Running on Empty: How the Democratic and Republican Parties Are Bankrupting Our Future and What Americans Can Do About It (Picador, 2005). Joe Trippi, The Revolution Will Not Be Televised: Democracy, the Internet, and the Overthrow of Everything (Harper, 2005). The two most useful free online collections are www.oss.net and www.earth-intelligence.net. In my view, no organization should be exempt from taxes unless it can show that at least fifty percent of its outlays are directed at publicly identified social needs.